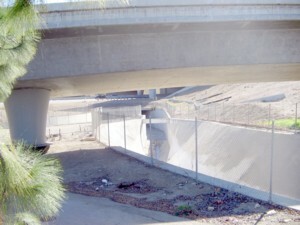 I recently read the OC Register story on the possibility of a new Bike Trail in Costa Mesa. As a BikeBlogger, who lived in Costa Mesa for 2 years, writes about cycling in the city, and the Back Bay as well, not to mention writing about cyclling in the OC in general, I was interested. I made a couple of trips to explore the route, as described, before writing my own story as a follow-up to the one in the Register. Did you go wandering around for a look see, as well, before deciding to explore this idea? I applaud your goal, but the article/map, give the impression that the trail would be continuous, when all the evidence I saw clearly shows otherwise. I just completed a 3 part series, with pictures, and will add more chapters as the story warrants. New Bike Trail Plan in Costa Mesa Brings Questions. There is a link leading to the next chapter to make it easy to follow the story. I, and my readers, would be interested in your thoughts on my report, and any more light you can shed on what is being planned. Is there something on the City Website that I could check out for more info? I received responses from both. where the trails plan is presented before commenting in such detail. the channel again, that is better than no trail at all. I hope you agree. You should not be surprised that I would do a report. Working with what you have is what I figured you would be doing, and showing the public what is there, as opposed to what the OC Register article implies ( The reporter admitted visiting the area, and said, in retroispect, he could have been more clear than he was. ) is what I hope is just a start to my covereage. I agree wholeheartedly, that a break in the trail is better than no trail at all! You can either have a striped lane from Bear to the channel, or cross the street for a short extention behind those busineses along the same stretch to the underpass at Newport, I suppose. It's the other connections I'm curious about as well, from there to the Bay, to see what you plan. As you can tell from the route I created for a tour of the City, I am a supporter of efforts by city goverment to provide cycling opportunities for their residents. My Blogging about your current effort is just a "New Media" version of the old standby where citizens appear at meetings to speak, or pontificate in letters, to their reps, or the local paper. Citizen interest in the activities of government is important, and is often sorely lacking. I am determined to do my best, on both my blogs to show an interest in my city ( Santa Ana ) , and the OC in general. While I may not be able to attend meetings, since I often work 6 days a week, there are other ways I can learn to use to keep abreast of things. When I creatred the Tour of Costa Mesa I had this notion of doing one for each city in the county, but life had gottten in the way of my doing that, short of a ride along a bike trail in Santa Ana. This year, I plan to begin to rectify that by rejuvenating the project by 1st doing a tour of the city I hope to live in a long, long, time, Santa Ana. When, and where, is the Study Session, and if I am unable to attend how can I learn about what was discussed. I wish to do what I can to help gain support for your porposal. Thank you for your interest in Costa Mesa, and cycling in general. preliminary step towards consideration of a trail. 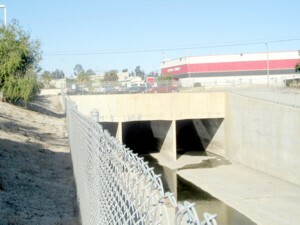 provided needed links between Santa Ana River, and the Back Bay. necessary time and effort to thoroughly explore all related issues. talk to you whenever you would like to visit our offices. I think that you are doing the right thing by exploring all aspects of your idea before proceeding, and hope I am not the only user of the city trail system to contact you, or appear at meetings to opine. As you can tell from this link ( NOTE FROM SNEAK TO READER: Included link to this post! ), and may have already heard from Mrs. Foley, I responded, in more depth, to her e-mail to me. I would love to attend the Study Session she mentioned if I knew when, and where, and am able. Alternatively if there is info posted online afterward, or is currently info online, I'd be interested in the links. I'd love to come in for a visit, and will see what my work schedule is, and get back to you. I recently read your story on the possibility of a new Bike Trail in Costa Mesa. As a BikeBlogger, who lived in Costa Mesa for 2 years, wrote about cycling in the city, and the Back Bay as well, not to mention writing about cyclling in the OC in general, I was interested. I made a couple of trips to explore the route, as described, before writing my own story as a follow-up to yours. Did you go wandering around for a look see, as well, or just do your story based on the what the Officials said? I applaud their goal, but they, and by extention, your article/map, are giving the impression that the trail would be continuous, when all the evidence I saw clearly shows otherwise. I, and my readers, would be interested in your thoughts on my report, and any more light you can shed on what you learned in reporting this story. break in the chain, so to speak. Hi there, and Thanks for replying! Seriously... I applaud the Register for making the story public in the 1st place. How many folks would know the idea was even being contemplated if the Officials had not had the medias help to publicize it? Just so ya know.... I work 6 days a week mostly, and those shifts begin as early as 1245pm, or as late a 3pm, thus meaning I don't have the chance to attend meetings, and the like, unless they fall on off days. City Officials respond in Part 5. After exploring the proposed route for the new Bike Trail, in Costa Mesa ( The story begins here. ), there was 1 more thing I needed to do: Discover where the 2 Concrete Channels meet, and become 1. So I returned to Bristol St. and Bear. Actually I got off the bus at Bristol and Baker, and rode south to a little side street, just before the 73 frwy., called Randolph, Ave., that heads east, and deadends at a gated Apartment Community called South Pointe. 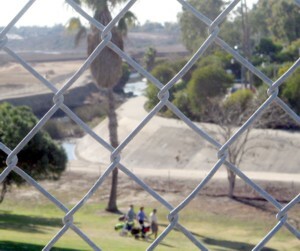 Luckily the gate was opened by a person on foot, and so I ventured forth, riding around until i came to where the complex comes up against the Santa Ana Dellhi Channel as it heads south. From there I saw that tthe merger I suspected was closer to the freeways, and so returned to Bristol, and Randolph, where there is a Business Complex across the street from the Memphis Restuarant. The eastbound Paularino Channel, that stopped at Bristol, and Bear, re-emerges from under the 73, on its north side, next to the back parking lot, of the Business Park at 2900 Bristol. The notion that this proposed trail would be continuous would be shot to pieces, by what I saw in this little corner. Recreation aside, officials think the plan would spruce up downtrodden channels, which often abut homes but also lure vandals and transients. "If it were improved and it were a place with a lot of people and a lot of activity, it would prevent a lot of deterioration," said Councilwoman Katrina Foley, who has been spearheading the proposal along with city Transportation Manager Peter Naghavi. I agree that creating a Multi-use Trail along the route in question would improve the area, but there would have to be several, unconnected, Trails, with maybe Class 2 striping, on Bristol between the end of the accessable Paularino, and the start of the accessable Delhi, sections. At the places where streets cross the path of the channels some way of getting to the other side would be needed, whether a cross-walk, or tunnel. After coming out from under the 73 the Paularino, takes a short jog, and merges with the Delhi. Wanting to get a clear shot of the merger, and where it goes under the 55 and 73, I walk over where the complex, and the Delhi, are next to the 55. So I settled for getting close to the ground, and up against the fence, for this shot, instead. The next, and final, piece of the puzzle, was now pretty clear to me. I returned to Bristol, and rose south to where i had earlier seen the Delhi emerge next to the Acapulco Restuarant. On the north side of the street are Bristol Mini-Storage, and Ganahl Lumber. Locking my bike outside the lumberyard I ventured into the wilds of Ganahl's outdoor backlot, and discovered a little corner, up against the fence that separates the yard from the storage, and the fence that separates the yard from the freeway. Climbing onto an unsteady perch, on top of a stack of some huge something-or-others, I got a nice, clear, view. It obviously is under the Mini-storage. The Channel returnes to daylight, after going under Bristol, as you can see in my final picture, then heads SE past Golf Courses, as shown before. As the article in the Register reports: "Naghavi said he has met with county officials about the idea, but that any design awaits City Council direction. A study session will likely be held next month, Foley said." Well, I plan to write to both, this weekend, about what I found, and see what they have to say about this. I'd like to assume that they know of the complications I've detailed, but the article puts doubt on that assumption, so I figure that my report will, if not open their eyes to something unknown, serve as a visual reminder. When the High Poobahs of a city decide to look into adding a Bike Trail to the community landscape this is a good thing, but when a look around the proposed route leads to some very serious questions of viability one has to wonder what the Officials are thinking. I have made 2 trips to the area, and in this, and the next post, will detail my findings. I then willl let offialdom know, and see what more I can learn that might shed some light on the plans they say they are considering. The article in the OC Register ( Linked in Part 1. ) tells what little we know. 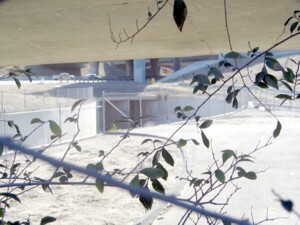 Dusty, weed- infested gullies could become cycling havens under a plan in the early stages of study by city officials. 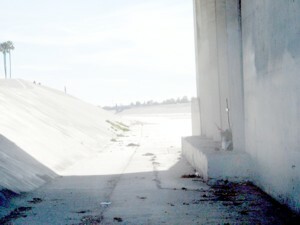 The "community trail" concept calls for topping flood-control channel levees with decomposed granite and unlocking the channel gates, giving cyclists a clear path through heavily urbanized terrain. 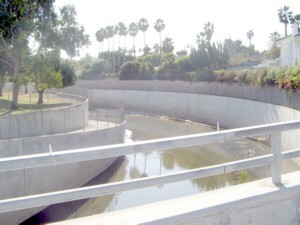 Similar flood-channel trails have been built in Irvine, Orange and Seal Beach, among others. 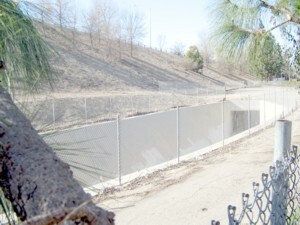 Several years back, Costa Mesa built a 2.5-mile trail atop the Greenville-Banning Channel, which parallels the Santa Ana River. 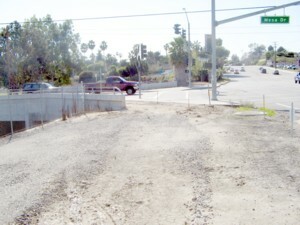 That channel trail provides access to/from the Santa Ana River Bike Trail at Fairview Park on the west side of town. The path now being studied would be of similar length and run along Paularino Channel, which begins near Fairview Road and Baker Street. It would meet the Santa Ana Delhi Channel near Baker and Bristol streets, and then run almost to Upper Newport Bay. 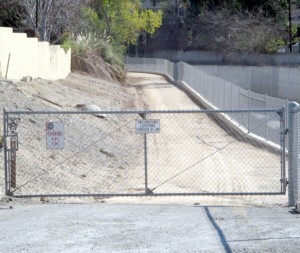 In Part 1 I showed you 3 pictures: A View the Paularino Channel at Baker/Fairview, a view of the Santa Ana Delhi Channel section, south of Mesa Dr./east of Irvine Ave. showing the route leading to the Back Bay, and the same channel off Santa Ana Ave./south of Bristol St. showing a locked gate with a No Tesspassing sign, blocking access to a posted County Multi-Use Trail. On my 1st visit, after leaving Fairview, I headed east on Baker, to Bristol. After heading south, under the 73 frwy, I came to Bristol and Bear St.
MORE than 2 blocks south of Baker. This is where the 1st trail meets the 2nd, and then they live Happily Ever After all the way to the Bay! 1 problem: There is a freeway blocking eastbound access. The path beyond the gate is a short one that goes behind business I ride past as I head south/East on Bristol. Okay, I thought, this is interesting. Where's the blasted channel? 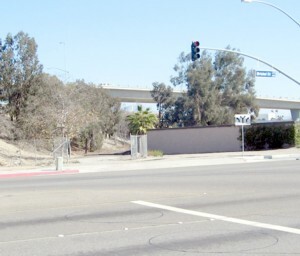 Just east of where the 55 and 73 meet, at Bristol st. and Newport Blvd., is an access road that leads to one of the freeways, behind a Mini-Storage. Walking back there I discovered no view of the channels. By now I realized that the idea of a non-stop trail was non-existent, and was curious to see what other surpises might me instore the rest of the way. I returned to Bristol, and a block further east I came across the, now merged, Santa Ana Delhi Channel. It is now heading SE next to a Golf Course. The access is next to a dirt lot used for excess parking related to the Extra Storage, and Acapulco Restuarant on its west side. 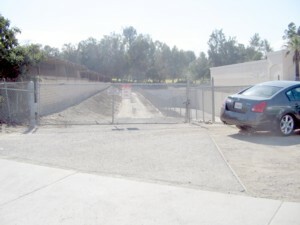 Not exactly the best place to put a Bike Trail Access, unless you eliminate the dirt lot. I continue east on Bristol, to Santa Ana Ave., and a short distance south of the intersection pick up the channel again. Santa Ana Heights is a community with a Homeowners Association, and lots of Horse Lovers, and a few Horse trails including one that parallels the channel, to the Bay, as shown in the picture in pt.1. This is where I came upon the locked Country Trail, as shown also in Part 1. A man I met later gave me to believe that residents of the area may have keys that allow access to the trail, but I don't know for sure. I went south on Santa Ana, then east on Mesa Dr., where I found the Channel one last time, at Irvine Ave., along with another Golf Course. The trail runs east through the course before going under Irvine Ave.,, then south to Mesa Dr.
As you will see from this, and the next pic, there is no access to the channel, just a gravelly area the short distance to Mesa. The Golfers have to cross the street to get to another part of the course, and there is no public access to the channel on either side of the street. With the course on the left, and the backyards of houses on the rigght, there is no public access. Following the dead-end street that is just south of the intersection, and heads east, roughtly next to the trail, I can get closer looks at the channels, and the Horse Trail on the far side, once the channel leaves the Golf Course behind. As you can see from the picture in Part 1 there is a lot of space over there, all the way to the Bay. But what about where the 2 channels meet? I was still puzzled about this, and decided to return for a closer look to see if I could find the answer. In an effort to find where those 2 channels become 1 I went into a gated community, then into a nearly empty business complex, almost climbed a fence to the freeway to get a better photo, then just got almost on my stomach instead. I think you will find what I discovered to be quite interesting. Almost every day since I moved into my apartment in Santa Ana I have used the Santa Ana River Bike Trail in my commute to work. Under the 1st Street Bridge Crossing, it was being tended by someone who, when I stopped to look, from a distance, that 1st time, and called out a question, reacted in heated Spanish, so I rode on. Every so often I would notice a change in flowers, and would marvel at the fact that no-one had removed it from the scene. Not transients, not Law Enforcement, not County Clean-up Crews. Not even God saw fit to wash it away during a rain. The Bike Trail passes it, and there are entrance/exit, lanes to/from the street, on either side of 1st. I wondered if I was the only one to glance at it as I pedaled by, and if anyone else ever stopped to take a closer look? Finally, on New Year's Eve, I stopped again, and decided to do more than just look. I wanted to see if I could learn something more. A search of the Social Security Death Index turned up 1 person by this name, who died in Santa Ana, but he was not this one. 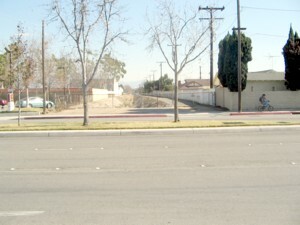 That one was born in 1904, and died in 1965.
Who was he why was he killed here, and how? Someone who cared very deeply for this man was keeping his memory alive on this spot, maybe hoping the Memorial would spur someone to come forward. 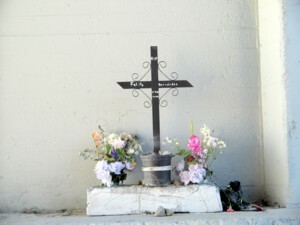 The black metal cross is strapped by a rope to a bucket full of rocks. Roses, and other flowers, surround it, and there is also a glass with a white Novena Candle, behind the bucket. The Candle shows some use. 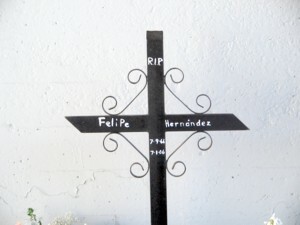 Felipe was born on July 9th, 1966, and died on July 1st, 2006, just short of his 40th birthday. 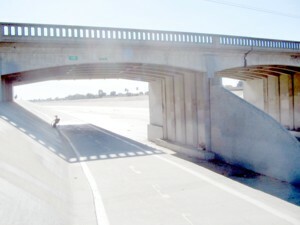 On July 1, 2006 at about 6:25 a.m. the body of Felipe Hernandez was discovered lying in the Santa Ana Riverbed near the 1st Street overpass. The case is being investigated as a homicide by the Crimes Against Persons homicide unit. Hernandez was last seen at the transportation center located at 1000 E. Santa Ana Blvd where he was to board a bus to Tijuana, Mexico to visit his wife. Initial investigation indicates Mr. Hernandez was possibly assaulted and thrown off the 1st street bridge. It is unknown why Felipe was in that area, or who was with him. Contact: Sgt. Lorenzo Carrillo (714) 245-8715. There is a mystery, here, and it is not important whether Mr. Hernandez was in the United States Illegally, or not, though it's possible that if he was then that could have had something to do with his fate, and thus be important for solving his murder. When was he at the Station, and when did he leave, who with, and why? What led to his murder at the channel? No-one should die the way he did, and maybe posting this story, here, will help spread the word of his case, and lead to its solving. ***UPDATE -1/29/07*** The photo of Mr. Hernandez, that was here, has been removed out of respect for his family. A friend advised me that since Bloggers don't yet have all the protections that Mainstream Journalists have, I might have to get the family's permission to use the photo despite the Cops having the OK to distribute it. Anyone wishing to see the photo can request it from the Officer mentioned in this story. Recent rains brought enough water to flood the channel enough to reach the memorial, and sweep it away, and it has not been replaced, as of Mid-May. I think whoever had been keeping it up took this as some sort of sign to move on with their lives. The home of the Los Angeles County Bicycle Coalition. I had a reason for the trip, and met a couple of really cool folks holding down the Fort. One was Monica Howe, the Outreach Manager. Now the rest of LA, outside the Pols, and her fellow Cyclists, have met her too, thanks to a recent article in the Los Angeles Times. It scares her to ride her bicycle to work. A vague prickle of apprehension follows her along Sunset Boulevard and down Spring Street on her way into the teeming core of the city. But she rides anyway. Her faith in the future of the bicycle overpowers her dread of the cars that rule these impatient streets. Indeed, it's Monica Howe's job to argue the case for the bicycle as everyday transportation in Los Angeles. The bicycle is central to her social life in the city, her romantic life too. It's the source of her idealism. If you've known her for a while, you understand that the very thought of the bicycle in Los Angeles makes her smile. She had only been in her job for a couple of months when I met her, but it seems she's been active in the LA Cycling Scene for a few years before that. As I wrote in September, the LACBC is Building a More Bikeable LA County, and she is playing an important part in that activity. Being around Bicycle Kitchen, Whirly Girls ( A.k.a. the City of Angels Ladies' Bicycling Association ), and Midnight Ridazz, had a profound influence on her, apparently. Right away she turned up the volume for this small advocacy organization that is dedicated to "improving the bicycle environment in the county." The traditionally conservative and cautious cycling establishment found itself with a genuine urban insurgent in its midst, and cyclists around the city could detect a fresh spurt of determination. Hee, hee, hee, um, oh, sorry, but my 1st reaction was that I wanna know what this reporter was smokin'! "What has to happen now — and what I think will happen in five years — is we'll see new advocacy groups joining in the work of making room here for the bicycle. Los Angeles is really the last big city to realize that bicycling is a good idea. "In Los Angeles, people are sick of driving, sick of looking for parking. And most trips are under five miles. But people don't want to ride in a city that feels dangerous." She has thrown herself into the campaign to demand the stenciling of "sharrows" on city streets. A sharrow is a bicycle symbol with two chevrons that is meant to remind motorists to share the road and also to promote better lane positioning for those on bikes. Howe has rallied cyclists to demand safer streets. She has led efforts to support cyclists hit by cars. She has promoted group rides that bring residents in touch with unfamiliar neighborhoods. She hammers away on the idea that bicycles are the only zero-emission transit machines. "It's a Catch-22," Howe said. "Officials in this city won't take the moves to make it safe until there are more bicyclists. Until they see bicycles all over the road, they will continue to regard us as freaks. Yet, those who commute by bicycle today are taking huge risks. "I've had to visit friends in the hospital this year." Her description of the attitude of Officials is one seen in far too many cities. Even when the Officials support cycling innitiatives they sometimes mess the effort up somehow. The current Trail proposal, under discussion in Costa Mesa, seems to be one such instance, if my on site explorations the last few days are any guide ( More later ). A list of attributes of bicycling in Los Angeles begins with the self-evident: economy, exercise, efficiency and, if you regard congestion as a wrongheaded way to live, even rightness. These are good reason to bicycle regardless of where you live. Howe represents a school of thinking that holds there is more to it still. Bicycling is an expression of curiosity, Howe said: "the need to scrutinize and question the world around us." Getting out, and about, on your bike brings you into close contact with your environment, and community. You see things differently than from in your car, and you see MORE. For instance, there is a story I will be sharing, soon, about someting I have been seeing on my commute, since July, and that motorists, on the street nearby, have absolutely no clue about. Los Angeles on a bicycle is both a more intimate and a vaster place. Because the rider is exposed, and vulnerable, it is a more engaging landscape. "To ride a bike in L.A. is to examine the accepted ways of doing things," she continued. "It's a way of stepping out and seeing things in a different way." To ride a bike ANYWHERE is a way to see things differently. She's L.A.'s pedal pusher: Monica Howe sees herself as the voice of a two-wheeled future, dedicated to the notion that an urban bicycle culture will make this a better place to live. A Tip of the Hat to Robert Daeley, of the new Outdoors Blog called End Pavement, where he blogged the story for his Cycling Archives. The LACBC website is a great place to find out about cycling activism in LA COUNTY. MOTION: Consideration of Bicyclists and Pedestrians in Transportation Projects in the City of Los Angeles – submitted to the Planning and Land Use Management (PLUM) Committee. View the Motion. I am not ready to say "that all vehicle collisions with bicyclists are the fault of the motorists", not by a long shot, because it is far from true to say so. This just seems like another one of those cases where well meaning Cycling enthusiasts, in Officialdom, think they are doing something useful, when they may actually not be. In 2006 there was a rash of such accidents all across Orange County, and some of them were the fault of the cyclist, or, in at least 1 case, the cyclist was doing something they should not have been doing anyway at the time of their misfortune. If you want to "increase the awareness of bicycling", among motorists, it seems to me that the 1st thing you don't want to do is throw all the blame for injurious/deadly encounters between you, and THEM, in THEIR front seat. It will be interesting to see how far such a notion gets. 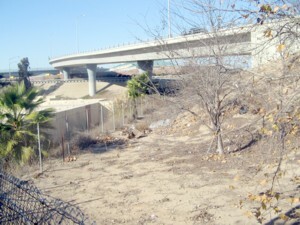 On Monday came word of a plan by the powers that be, in Costa Mesa, CA., to possibly create a new Trail in the city. It would begin off Fairview Ave., south of Baker St., and head east. As I detailed, in creating a 27 mile Tour of the City, in 2005, there are several other Trails in town ( I plan to finally add pictures to this story, soon! ). It would end up by possibly connecting with the existing trail on the north side of the Back Bay, or coming close. I got nosey, yesterday, and spent 2 hours scoping things out, using the map that came with the article, and the article itself, as my guide. To say that I have serious questions is a major understatement. When a clearly marked ( See the sign just inside the gate, on the left? ), short, County Multi-Use Trail has locked gates with NO TRESPASSING signs, it leads one to wonder what Officials are thinking. That is not the half of it, though. I have 8 other photos, and almost as many related questions, and detail them beginning in Part 2. ( Read Part 2 here. ) . I plan to return to the area this weekend, and will be trying to learn more from the city after my report. Costa Mesa Studying Bike Trail. I read every one of your posts, Kiril. Keep it up! For the life of me, despite having access to RSS Feeds, I don't see how anyone can keep up with even a fraction of all the great BikeBlogs out there, but am in awe of anyone who can even come close ( And still have time to Blog themselves! ). I have read few Blogs, and Blog posts, the last couple of years, because it is all I can do to find time to keep up with my own Blogging on 2 Blogs. I believe that the same thing applies to many Bloggers, of all types. This struggle to balance one's Blogging Life, with the rest of one's life, I think, is just 1 reason why so few people, in Niches such as ours, are aware of each other, and why readers of Mainstream, big name Blogs, that cover daily life, news, politics, and war, don't know of us either. You see I learned a valuable lesson a couple of years ago. It was a lesson that I had to re-learn a 2nd time, for different reasons each time. In the 70's and 80's I read, and read, a lot: Books, Comics, and Mags. In the 80's, and 90's I added Movies, TV Prime Time Series, and Videos. They were my refuge in a lonely life, because I could not afford to do much more, and had become comfy with what life I had. In the late 90's/early 2000's, after going bankrupt, moving for the 1st time, changing careers for the 1st time, and then going online, and beginning the transformation to who I have become today, I gave certain things up, and cut down drastically on others, and found time to widen my horizons, and improve my life. Blogging, and Blog Reading, though, can take up as much time as all that other stuff, I discvovered. There is simply no way to read all that I might wish to, much less Blog about it, too. The problem isn't noticing the consumer blogs, but keeping up with so many that are out there posting daily. Thank You Fritz, and anyone else who reads my stuff, and spreads the word about it. With 4 years under my belt, this month, it is important to me that you know I appreciate you, and hope to do more, this year, to check in on your own fine work. I don't pay all that much attention to goings on in the "Industry". In 4 years of BikeBlogging that has never been my main interest. There are a few Industry Types with Blogs ( and you know who you are, heh, heh. ), but for the most part it seemed that the Industry was not taking BikeBloggers seriously. Hell, I can't even get the head of the Congressional Bike Caucus to respond to me. Sept. 11, 2005 = Calling all Cyclists!! Sept. 29, 2005 = Congressman Earl Blumenauer Responds to Letter. Oct. 21, 2005 = No response to follow-up to Webmaster of Congressman. At least I got SOME RESPONSE. Ever since I've been getting occasional e-mail updates, from his office, that cover just about everything, except cycling. I can barely count on 1 hand the responses I got to the original letter, nationwide, from the dozens of Activists, Clubs, Shops, and Magazines that I wrote to. Sort of discourages one from reaching out to those more influential than you, ya know? In the past year Industry attention seems to be slowly evolving, and I've been ecouraged by the few contacts I've received. One example of this is the Blog begun, last June, by the folks at Interbike ( We practically be neighbors, it appears! ), one of the oldest Bike Expos in existence. I received a comment from Rich Kelly, as a result of some nosing around he was doing after discovering the B-List. This led him to visit my fine establishment, this morning, and leave a comment to my story called "Joining OC Wheelmen Share the Road Campaign". I want to share his words here, instead of through the Comments. Since we're located in Orange County, I obviously take interest in these issues. Nice work publicizing them and working on getting motorists to share the road with us! On a National level, I would highly recommend that OCW (and any other cyclist) consider sending a representative to the National Bike Summit in Washington, DC in March. All of these issues are brought up to the federal government that has some significant funds set aside for bike projects that were attained through the great efforts of the League of American Bicyclists, Bikes Belong Coalition and many, many other passionate bikers. It's truly a great opportunity to advance the causes that are so important to us as cyclists and an incredible hands-on civics lesson. Keep up the good work, Kiril! The note from Rich is another one of those, what he calls, "Thanks, I Needed That" moments when I learn that there are really folks out there reading this Blog, and using its resources. This knowledge is what spurs me to keep writing, and finding new ways to improve the place. If I could afford it I'd go to an out of state event like that in DC, or Vegas, and maybe with planning, going next year might be a worthy goal to pursue. In the meantime maybe I can attend one of our SoCal Expos this year, I'll see. So one big story, to some, in 2006, seems to be how the "Cycling Community has embraced the “New Media”. Only time, and how the Industry, Clubs, Pols, and Activists, decide to reach out to the regular BikeBloggers who make up the majority of our Blogging Niche, will tell us how true this "Embrace" is.